Creative Commons (CC) is a project building a new and more flexible paradigm for copyright. CC develops standardised copyright licences and other (optional) technical tools to assist authors wanting to share some of their rights with users and fellow authors in a way that is easy, flexible and legally rigourous. 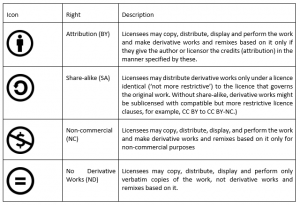 Creative Commons licences were originally designed for sharing creative works. They may apply to all types of works (scientific or not). CC licences protect the people who use or redistribute an author’s work from concerns of copyright infringement as long as they abide by the conditions that are specified in the licence by which the author distributes the work. Such licences all grant the ‘baseline rights’, such as the right to distribute the copyrighted work worldwide for non-commercial purposes, and without modification. There are different CC licences, some more permissive than others. Some types of licences are particularly broad: the public domain dedication mark such as CC0 (‘No Rights Reserved’) or PDM (‘No Known Copyright’), the licence CC-BY (‘Attribution’) or the licence CC-BY-SA (‘Attribution/ShareAlike’). ‘The term public domain refers to creative materials that are not protected by intellectual property laws such as copyright, trademark, or patent laws. The public owns these works, not an individual author or artist. Anyone can use a public domain work without obtaining permission, but no one can ever own it (Stim 2010) (see also: https://en.wikipedia.org/wiki/Public_domain). Eventually all original works enter the Public Domain at some point, namely when their copyright protection expires, but it tends to take a long time – in most jurisdictions this happens at least 70 years after the author’s death! Nonetheless, copyright holders might want to dedicate their works to the public domain at any point. In order to do so, they need to explicitly state that they do not wish to reserve any of their intellectual property rights over a given work, something that can be done for instance, by making use of the CC0 tool. Using CC0, you can waive all copyrights and related or neighbouring rights that you may have in all jurisdictions worldwide, such as your moral rights (to the extent waivable), your publicity or privacy rights, rights you have protecting against unfair competition, and database rights and rights protecting the extraction, dissemination and reuse of data (see https://creativecommons.org/choose/zero/ ). ‘In contrast to CC’s licenses that allow copyright holders to choose from a range of permissions while retaining their copyright, CC0 empowers yet another choice altogether – the choice to opt out of copyright and database protection, and the exclusive rights automatically granted to creators – the ‘no rights reserved’ alternative to our licenses’. For instance, you may find datasets contributed by researchers to the worldwide Public Domain at Figshare. Another example is PixaBay; a repository of high quality photographs and illustrations that only contains public domain content released under CC0. While users can give credit, and even donations, to the authors of content, this is not required. Rather than thinking of open and closed as binary concepts, it is more appropriate to see them as the two ends of a wide continuum that can include different levels of openness (or closedness). 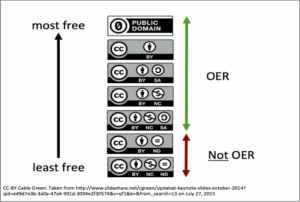 That is, resources can be more or less open depending on the rights reserved by their authors, being Public Domain is the most open possible option.